The Sunday after Easter is often a “down” day. Attendance is usually down, and people are “coming down” from their Easter high. And it is this Sunday, the second Sunday of Easter, that we read the story of Doubting Thomas in the Revised Common Lectionary. 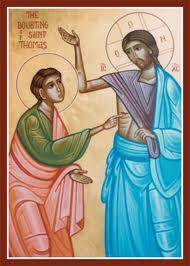 But mostly I love the story of Doubting Thomas because it reminds me to be bold enough to doubt out loud. Please don’t misunderstand me. I’m not saying people should fill their heads up with doubts and not do anything with them. But, we are human, and every last one of us is prone to moments of doubt. We need to be a people willing to look at them, acknowledge our moments of skepticism, and then do something about them. But Thomas didn’t just file his wonder away, he said it out loud. He laid it out on the table for all to see. His conditions for belief were not all that unreasonable: He wanted to see the holes left by the nails and by the spear. It’s clear that Jesus wasn’t so terribly offended by the demands. Although Jesus did emphasize the importance of being able to believe without seeing, he opened up his robes and offered the wounds for Thomas to inspect. Thomas was able to realize through this inspection that the person standing before him was not just a person who looked uncannily like his old friend, but was indeed Jesus himself. Imagine how differently things would have been, though, if Thomas had kept it to himself. Imagine if he had given in to the pressure of his friends and claimed to accept something he could not really believe deep inside. Imagine if he had just given the same pat responses expected of him and never let himself explore the doubt bubbling up inside. As it is, with Thomas being bold enough to express his concerns out lout, he was able to receive the proof he needed. And from there, Thomas would go on to be the Apostle that would stop at nothing to carry the gospel to the ends of the earth, just as Jesus had told them to do. He didn’t just push outside of Jerusalem. He didn’t just go to the edges of the mighty Roman Empire. He went beyond–Thomas carried the gospel of Jesus Christ all the way to India, sharing his witness and baptizing people in the name of Jesus all along the way. Whether we want to admit it or not, doubt has a lot of power. But how we approach doubt will determine whether it has power over us, or will become a power that works for us. If we keep it bottled up, refusing to address it or to wrestle with it, it will fester and grow. But if we look straight at it, see what it wants from us, and deal with it, we are the ones who grow. Too often, churches and Christians alike, discourage doubt. When the questions are asked and we don’t have an immediate response, we panic. Throughout the ages, people with legitimate questions and legitimate concerns have been stifled. But stifling their wonder doesn’t make it go away, it just plants it deeper in their souls, where it will find plenty of new soil in which to grow. And it is not the example Jesus gave to us at the very beginning of the new age that began with his Resurrection. The example Jesus gave us was not to stifle the questions, but to confront them. When Thomas said, “How can this be? No one can be alive after what you were put through!”, Jesus ripped open his robe and showed the wounds that had sent him to the grave and in doing so gave Thomas a new will to live. We need to be the church that makes it safe for people to ask their questions. Rather than stifling the curiosities and branding the skeptics as weak unbelievers, we should be sitting down with them and addressing their concerns. Should we find ourselves confronted with a question we can’t answer, we don’t need to panic and silence the questioner… we need to join that person in the quest for the truth. So, be bold enough to doubt out loud… but fair warning: Jesus will answer, and in that answer we may find ourselves being carried far and wide with the new faith we find!